The game was all but decided before the horn could even sound to mark the end of the first period. After battling back from three goals down against New Hampshire to pull out a 5-4, comeback victory in double-overtime on Friday, the Massachusetts hockey team made things a lot easier on itself in Game 2. In the first game of the series, it took the Minutemen (28-8-0, 18-6-0 HEA) 39 minutes to score a goal. 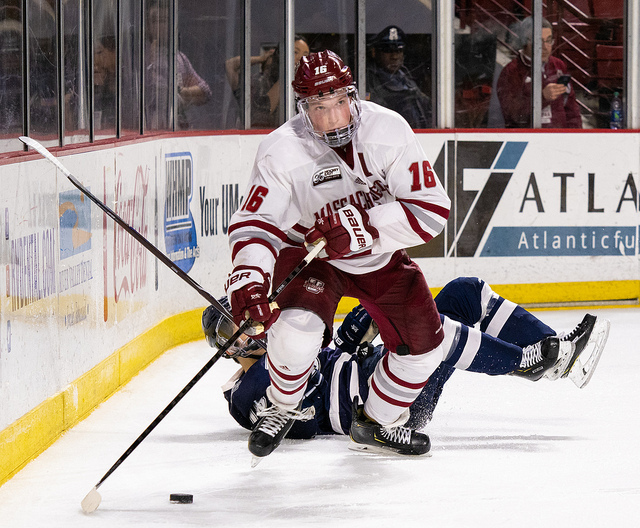 On Saturday, four first-period goals from Cale Makar, Jacob Pritchard, Brett Boeing, and Bobby Trivigno put things out of reach early and capped the quarterfinal sweep of UNH (12-15-9, 8-10-6 HEA) in style. Leading up to the 6-0 win, Mitchell Chaffee, who ended Friday’s thriller in double overtime, said No. 3 UMass had to learn from its goalless start in Game 1 to have a successful Game 2; and it did in a big way. Makar got UMass going with the crucial first goal of the night less than five minutes into the first period. Setting up behind Mike Robinson (5 saves) in net, Pritchard sent a pass to Marc Del Gaizo positioned at the blue line, who slid a pass over to Makar that the sophomore snapped into the net for a 1-0 lead. Spurred by Makar’s power play tally, the Minutemen scored four goals on their first nine shots on goal. After Trivigno buried his third of the series to extend the first-period lead to 4-0, Robinson was pulled. As if scoring four goals in the first wasn’t enough, the Minutemen did it after Friday’s marathon thriller. According to Carvel, being at the helm of a group that knows what needs to be done and what it takes to continually find improvements – like focusing on the first goal – is extremely beneficial as a head coach.